This 12 x 10 inch portrait was painted in pastels using an-emailed photograph - it is at the foot of this page. We all know how difficult it is to get a really clear and wonderful photograph of our pets.... it certainly needs time and patience to capture the perfect photo of your much-loved pet! The best portraits come from the clearest, in focus and higher resolution photographs. The amount of close up detail is vital to ensure the success of the portrait. The majority of my work is undertaken from e-mailed or messaged digital photographs (JPEGS) - I then display them on my PC or tablet PC and can enlarge them to show the fine details very easily this way. I have undertaken portraits from actual photographs as well though and have had great results from these too! I have written some hints and tips for you to look at and some good advice to ensure that the photo you send is a great one! You must ensure that the subject's eyes are well defined and that they have some light shining in them - this adds to the portrait's final 3D effect. Try to avoid the use of flash photography. This has a harsh and whitening effect and can lose detail from the photograph and distort the colours of the subject. Flashes can also distress the animal too and cause "red eye" on the final photograph. Taking photographs in natural daylight is often the best way too if you can. On a sunny day take the picture with the sun behind you and the subject slightly in the shade which will give a more flattering light to the subject. If it isn't sunny, try to find the brightest light possible. For indoor photographs, choose the lightest room and position yourself with your back to the window and the subject in front of you. Attracting and keeping your pet's attention - and to actually keep still is one of the hardest challenges that exist when taking their photographs! you may need to enlist some extra help at photograph time to hold them still or to attract them with their favourite toy! I have had to enlist plenty of help with getting photos of my own dog on many occasions before - it is hard to get "the right photo" but persevere - you may need to take 50 shot before seeing the ideal photo! You might like to think about including your pet's favourite toy in the picture, or them holding it in their mouth or paws to add an extra interest / individuality to the portrait. One very important rule to remember is to shoot the photograph at the same level as the subject - photographs taken from high up could distort the image and will not show a true reflection of your pet. Often the best results can be obtained from photographs that show the subject in a "three-quarter" view, or side on in profile too. 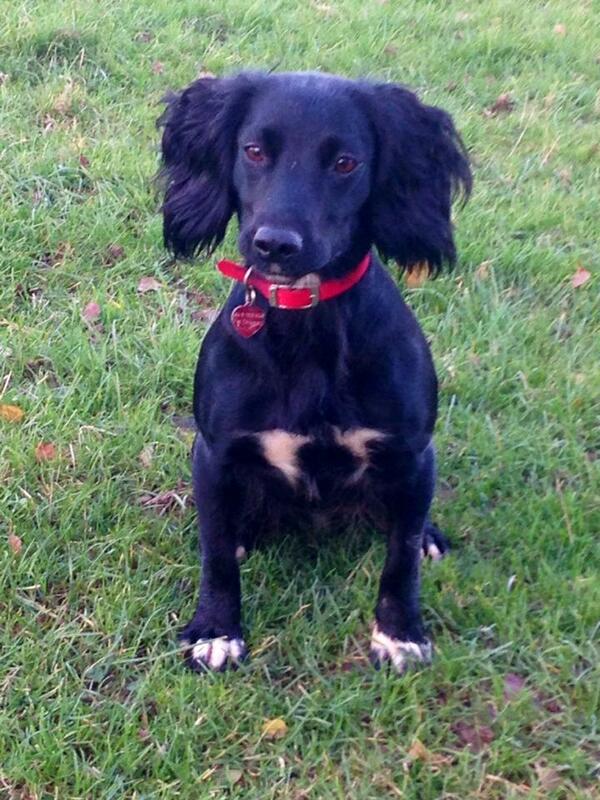 Your pet doesn't have to be captured looking directly at the lens/face on to the camera. If you can try and get some good close -up shots of your pet's eyes - this gives me even more material to work with! I can produce a multi-subject portrait from many different photographs - it doesn't have to be one photo of them that I work from. I have often worked in this way and have amalgamated different subjects from different time-scales. You could even choose a different background from another of your photographs for me to include as a background in the portrait. You could say that artistic licence can definitely apply here! Just ask me for any assistance with this! I have undertaken what I call "forensic work" from photographs, whereby I work from a client's blurry or unclear photograph. In this situation I paint the structure and form of the pet on the portrait and then email very regular updates to the owner to see if it is going in the right direction. I have had to forensically "age" a subject when the only photo I had was of when they were younger.... it worked and was a great success! Sometimes I have "conference called" clients using my tablet PC to take photos of the portrait in progress then emailed them straight away whilst they were on the phone to me - any minor adjustments were sorted out straight away. If all else fails, send me whatever photos you have and I can assess the difficulty of producing a portrait from them. I have been able to paint from some very dimly lit/blurry photos in the past and they have worked out well. I can travel (by arrangement) up to a distance of 100 miles from my address to take the photographs for you. There would be a mileage charge on top of the price of the portrait if you require this service. I have limited time presently to do this, but please ask for more details! This is a fair example of the sort of photograph that I often work from. It isn't completely in focus, but I can work from this quality of photograph. 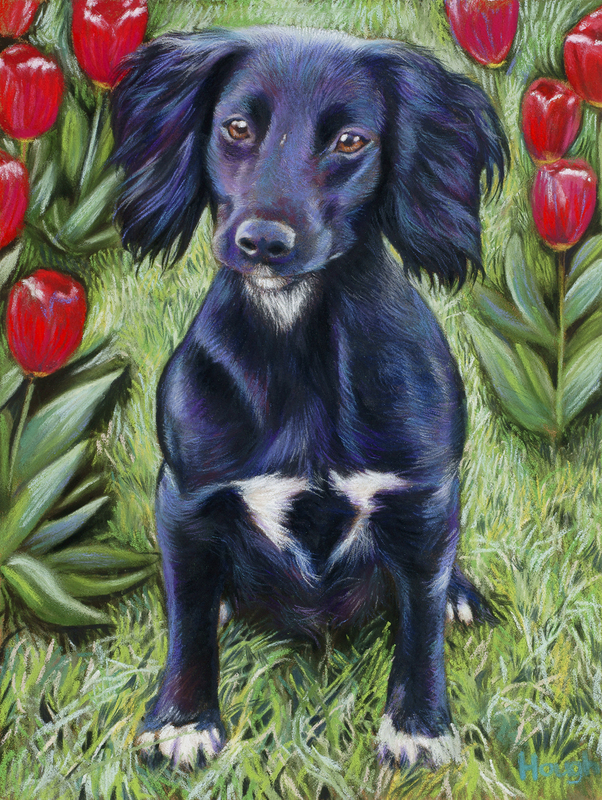 I added the red tulips to the portrait's plain grass background to add extra interest - the owner was overjoyed with the result!